Join us for a fun week of workshops and taster classes for kids of all ages in the April School Holidays 2019! Participating in school holiday workshops is a great way to make new friends, try new styles of dance or performance, and to help get kids excited for the next term of dancing! Over the April school break we have the following exciting workshops scheduled, open to all children whether you are a WAPS student or have never even danced before! At WAPS our school holiday workshops are divided into age groups (not ability levels) and we are excited to offer classes for Tinies (2-5yrs), Pre Juniors (5-7yrs), Juniors (7-10 yrs) and Intermediation/Seniors (11 yrs+). 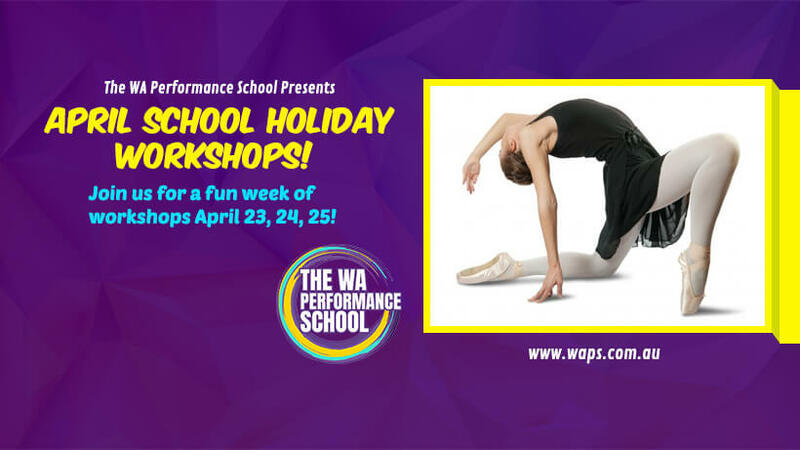 Bring along a friend and join The WA Performance School an unforgettable week of workshops! 1. Make sure you give it all you have, and be prepared to make mistakes – they help you learn. 2. Smile and introduce yourself to others, especially if you see someone who seems a little lost or maybe shy. Being kind makes for a better and more positive learning environment for everybody! 3. Ask questions! Especially when it comes to new technique or skills you may not be familiar with. Someone else in the room might be thinking the exact same thing. 4. Don’t be nervous! Take three deep breaths, and remember that every other student is in the same position as you. Try jazz, tap, hip hop and ballet – no special shoes required! Enrol in 2 workshops and receive 5% off tuition, or enroll in 3 or more workshops and receive 10% off! Places are limited, book today! Email dance@waps.com.au or call (08) 9388 6970. Note: While online enrollment will be available for these workshops, WAPS admin staff will need to manually process any eligible discounts before you make your payment. All payment is due as cleared funds a week prior to the workshops in order to secure your place.